The RAP was implemented as the first stage of the NZAID sponsored Building a Sustainable Future project. Building a Sustainable Future is a regional project that aims to assist in reaching the Millennium Development Goals by developing a range of practical community programs that use Education for Sustainable Development (ESD) methodologies to promote sustainable development in the South Pacific. 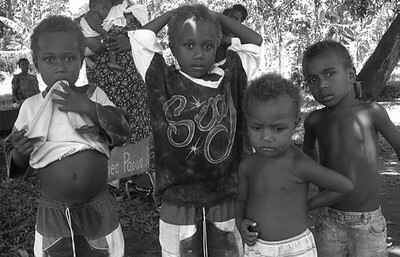 The project targets rural communities in Fiji, Papua New Guinea, Vanuatu and Solomon Islands and focuses on advocacy of ESD at a community level. It aims to establish community-based pilot and demonstration activities that will explore and develop high impact and practical environmental education approaches. These approaches will reflect ‘best practice’ and the values of sustainable development. Following evaluation and capture of the successes and inspirations from the pilot projects they will be mainstreamed and replicated through formal and non-formal education systems via Live and Learn’s existing network in the South Pacific region. The purpose of the RAP is to provide an analysis of community members’ perceptions in relation to social, economic and environmental issues, which will be taken into consideration in the design and development of forthcoming ESD tools and methodologies that seek to lead communities toward sustainable development. The RAP will also provide baseline information for evaluating the impact of ESD projects. Implementation of sustainable development projects in rural communities is essentially an intervention that seeks to create change, by re-orienting communities toward sustainable development. In order to create change, people from outside the community will invariably arrive with new ideas, and more than likely will have a different culture, established set of values, beliefs and perceptions. education for sustainable development approach as the “ultimate goal of the Man-environment relationship” (UNESCO 1995) because of the diverse conceptions of education and development that can be called upon to define it. The RAP approach is acknowledgment that there are many conceptions of what is sustainable development, and that the conception of sustainable development held by an educator, both philosophically and practically, is not necessarily in agreement with the community. This may be particularly true when educators are working cross-culturally, or seeking to implement concepts designed by those in developed countries in the developing world. The RAP seeks to understand the perceptions of the community and their conception of what is sustainable development from their perspective. The tool is designed to inform the development of educational interventions in order that they ‘start from where the community is at,’ rather than from the outsiders’ perspective. There are innumerable examples of well meaning development programs that fail due to a disconnection between what development or aid workers believe is important, and the actual values, needs, etc. of communities. Practically, the RAP looks at more than community perceptions of what is sustainable development. It also seeks to provide an understanding of the perceptions held by community members regarding needs, problems, opportunities, and capacity to undertake projects associated with sustainable development. The intention is to use the results to design projects that are relevant, make use of existing opportunities, and avoid unintended or negative impacts on the community. The RAP also introduces communities to the concept of ESD and engages people in the process of developing a project. The participatory approach encourages participants to explore and share experiences, ideas and opinions. In effect the RAP is Education for Sustainable Development, where communities explore, question and clarifying environmental problems, their root causes and their links to people’s wellbeing. Ideally, an assessment of perceptions should entail a thorough and comprehensive exploration and analysis of all stakeholder perceptions, issues and options. Practically, due largely to time constraints, this is often not feasible. Consequently a rapid assessment of perceptions was required.